Four of us headed up Quandary today. The weather was perfect. Hardly a cloud in the sky. Visibility went on for over a hundred miles (We could make out the Maroon Bells in the distance). There was fresh snow on Quandary over the past two days. From the looks of the trail I'd say it must have been around 8 inches. There was no issue at all route-finding as we another hike trekking up ahead of us in his snowshoes marking the trail. It turns out the guy making trail ahead of us was Bill Middlebrook of 14ers.com. 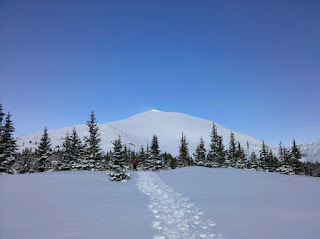 This was my second ascent of Quandary Peak and more excitingly, our group's first winter ascent of any 14er. Being our here in Colorado in March on a rare occasion we decided the time was right to give snow ascending a try. We had the proper gear including snowshoes, crampons, and ice axes though not all this was necessary on Quandary. We also liked the low avalanche danger on Quandary's East Ridge as we are not experienced at reading snow and avalanche signs. We snowshoed from top to bottom. With all the fresh snow below treeline it was a necessity. We noticed at least one person from another group today post-holing in the trees. Once on the ridge the snow was harder in sporadic areas mixed with other sections that were still 1+ feet deep. Once above 13000 feet the snow is mostly wind-hardened and packed down. The snowshoes for us up there became basically our over-sized crampons. The trail is just steep enough and the snow just hard enough that we were happy to have some "teeth" to grip the trail. We didn't bring ice axes and did okay with this, but in retrospect we would have felt more comfy on the descent with them. On our descent things we warming up. We were shedding layers every half mile or so. Once in the trees the trail got more and more slushy as we went. Near the TH there were two small parts of trail that had already melted out.